This week I'm embarking on yet another Spring Break College Tour, this time with my younger daughter Ify. As you may recall, the last couple of times I did this with my other daughter Aku we were able to pick up some nifty Senegalese sounds from a somewhat disreputable storefront on 116th St. in New York City. Unfortunately we won't be making it out East this time around (maybe next year), but I did want to pass on something I picked up on one of those earlier trips. Best of Thione Seck is not an "official" pressing, but it should be, gathering as it does some of the best tunes from Seck's cassette releases. Thione Seck himself is rather well-known to African music aficionados thanks to the release in 2005 of his album Orientation (Sterns STCD 1100). He came to notice in Senegal in the late '70s as a vocalist for the legendary Orchestre Baobab, but soon left to form his own roots-orienteed ensemble Le Raam Daan ("Going Slowly Toward Your Goal"). 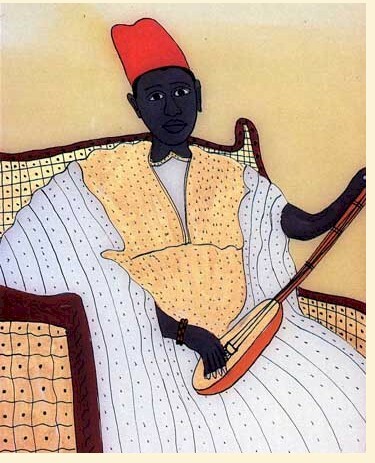 Today he is considered one of the greatest Senegalese vocalists of all time. 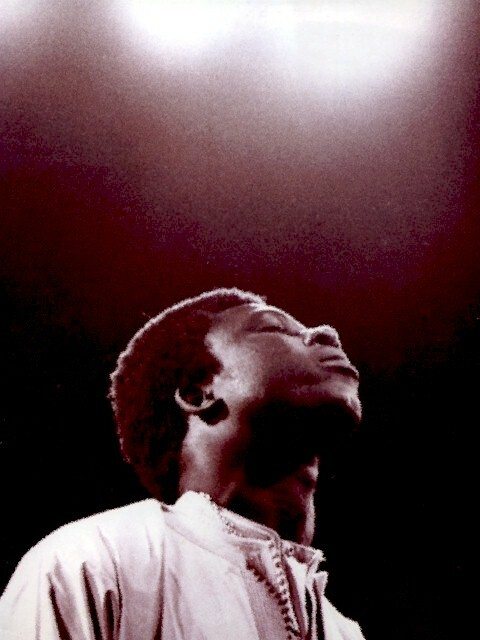 I featured a few tracks from Best of Thione Seck in an earlier post, but I'm sure you'll appreciate it in its entirety. 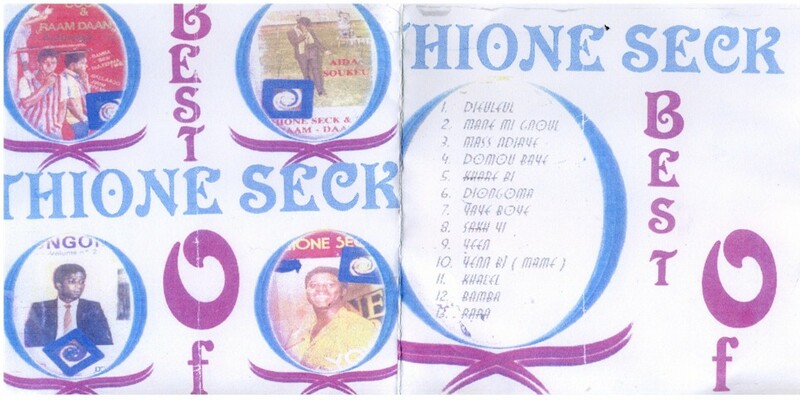 Download Best of Thione Seck as a zipped file here. The picture at the top of this post is by Tom Verhees. It is taken from the LP Le Pouvoir d'un Coeur Pur (Sterns STCD 1023, 1988). I've recently returned from something that's become a ritual for many parents of high school juniors: The Spring Break College Tour! My daughter Aku and I visited a number of esteemed institutions out East this past week, and were suitably impressed. It's going to take us a while to process everything and decide on a place where she can best pursue her studies in the years to come. Enough of that, though. Some of you may be familiar with Chris Meserve from his frequent auctions of African vinyl on Ebay. Chris gave us some excellent advice on where to stay in New York City (just a couple of blocks from his house in Woodside, Queens), and Aku and I spent an hour or so with him and his delightful two-year-old daughter Koko at Sri Pra Phai, a wonderful Thai restaurant in the neighborhood. I was first introduced to Thai food 35 years ago when I lived in Los Angeles. The cuisine then was almost completely unknown to the general public and L.A.'s Thai restaurants were patronized pretty much exclusively by immigrants. The food was fresh, uncompromising and usually fiery hot. Over the years as Thai food has become more popular in the US the inevitable bastardization has occurred. Every one-horse town now has its Thai joint dishing out mountains of sickly-sweet Pad Thai and "Volcano Chicken." There are a few standouts, notably Sticky Rice and Spoon Thai in Chicago, but I've generally despaired of finding the Thai food that I came to know and love in California. I'm happy to report that Sri Pra Phai is the real deal, and it's been acclaimed as such by just about every restaurant critic in New York City. So, check it out the next time you're there. Unfortunately there wasn't time to explore Chris's legendary African music collection. But no matter - Monday, after visiting NYU and Columbia, Aku and I paid a visit to Manhattan's Little Senegal along 116th St., and just steps from the subway discovered Africa Kiné, the most impressive of the neighborhood's many Senegalese restaurants. Here we enjoyed a repast of Thiebou Yapp and Dibi, washed down with homemade ginger beer, and while I don't think Africa Kiné reaches the exalted heights of San Francisco's Bissap Baobab, it's certainly highly recommended. I regret that we weren't able to visit more of New York City's African restaurants, which cover a wide swath of territory: Ghana, Côte d'Ivoire, Mali, Nigeria, Guinea and Ethiopia, as well as Senegal. Another day, perhaps! The most serendipitous discovery in Little Senegal, though, was a storefront offering hundreds of pirated Senegalese CDs at $3 a pop. All of the big names were represented, and lots of the little ones, too. In the back room we could see people busily copying CDs and stuffing them into slim-line cases along with crudely-copied liner notes. My reservations about contributing to this dubious enterprise were offset by the chance to obtain hard-to-find music at hard-to-beat prices. How could I resist? To hear some of the music I copped scroll down to the bottom of this post. Having heard much of Caffe Adulis, a legendary "Eritrean/Mediterranean" restaurant in New Haven, I was looking forward to a visit. The chef here has aspirations to broaden the parameters of Eritrean cuisine by incorporating influences from the Middle East and the Mediterranean, certainly a noble endeavor. Aku and I both enjoyed the "Adulis Appetizer," described as "seared shrimp sauteed with tomato, scallions, cabbage and garlic, served in a spicy, light cream, parmesan, basmati rice sauce." Perhaps to get a better feel for what Adulis is all about, we should have ordered a couple of the more adventurous entrees, but we wanted to sample the "Traditional Eritrean Dishes," lamb and chicken Tsebhe. What a disappointment! Both featured bland chunks of meat in an insipid, watery sauce, like Eritrean food from a can, if such a thing exists. I certainly can't claim to have tried every Ethiopian or Eritrean restaurant in the US (the two cuisines are almost identical), but judged by its execution of the standards, Adulis doesn't even make the top ten. For what it's worth, my favorite Ethiopian restaurant of all time continues to be Chicago's Ras Dashen. Here's some of the music I picked up from the aforementioned pirate shack. I also obtained an almost-complete collection of the recordings of Viviane N'dour, who will be the subject of a future Dakar Divas.